Does Jesus Walk Around Your Home? - Those Who Dream, Inc. I was thirteen years old the night Jesus met me in an attic room of our old farmhouse. That’s the day my life changed forever. A decade later, I had watched Him come running to the broken in 20 countries. I watched cataracts fall from a blind man’s eyes under the light of an African moon. And I married the love of my life who shared a heart for God and the world under that same African sky. But the greatest miracle I have ever witnessed was when my first baby — born much too soon weighing only a pound — came crashing into my world. We watched as God proved Himself strong through her and she is now a thriving four year old with no deficits. My story used to end there — with a miraculous telling of a baby who shouldn’t have lived and did. People lit up my social media pages with “God is good” and rightly so. He is. He always is. But my story — our story– changed again one rainy morning in August when our third baby, Beau was born sleeping. I’ll never forget the sound of the rain that morning on the window, or the fear and shame I had of letting the world know that God did not answer our prayers. And even in the midst of daring hope, we learned that lightening can strike twice, and we left the hospital again with empty arms and faced with writing another obituary and funeral for a son we would never be able to hold again in this life. I couldn’t write it — but my spirit ached with the awareness that He still was good. He still was there — HERE. He had never left. He hadn’t lost or somehow chosen to turn his head away from our suffering. The miracle in this deep, dark place was that Heaven had still won. And my boys were in a place that possessed a reality I had only hoped for in days past. For a long time I couldn’t sleep for more than two hours at a time. The sting of shock crippled me. Eventually I realized that my husband and living children were grieving too. And our kids needed us to guide them in walking through the pain and bewilderment of a loss that their little minds couldn’t understand. We started asking Jesus to walk around our home. Whether we felt Him or not, each day we invited Him near. Our family is still walking through the ashes of the loss we have encountered. There are highs and lows, but His presence never waivers. And our kids know Jesus is here. Raising our kids in God’s presence is more than attempting a glorified Sunday school. It is the very essence of the calling we have as parents –to help them cultivate a personal history with Jesus. And what we teach them will determine how soon they begin to walk in their destinies — and the fullness in which they walk it out. So how do we go about this task of connecting the Creator with our little ones? Truth is, we can’t. When I left for Africa the morning after high school graduation, I expected to bring Jesus to the world. What I soon realized was that He was already there when my plane landed! The same lesson is one we often learn as parents — we cannot do what only God can do. We can’t make our children be anything or become what we envision. But we can make sure to put them in front of His presence. We can become examples of lives laid down for Him alone. In grieving the loss of our sons, we realized that the greatest thing we could model to our children about suffering was to be transparent in our ashes and show them each day by living out the reality of depending on God for everything. Stop comparing Jesus to the Easter Bunny. One of my biggest fears early on was that my kids would equate Jesus to Santa, the Easter Bunny, or other cultural stories we pass down to our children. I didn’t want them to know Him because of my story. I wanted them to learn about Him from hearing His voice. 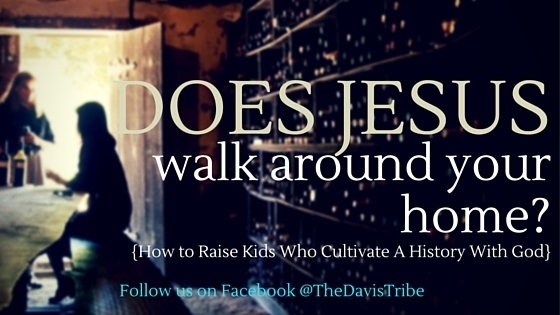 If you want your kids to cultivate a personal history with God, it’s time to talk about Him like He is real and present with us. Ask God about His dreams for your kids. What is His heart for your child? Have you asked Him? When we begin to hear His voice for our children, we can partner with God for the destiny He has for them. Daily speak destiny over them. Our words have power. I’ve been in public and cringed over words I have heard spoken from parents over their children. What are you speaking over your kids? Being intentional about our charge over them means we can partner with God’s heart for our kids by speaking destiny –what He sees in them–each day. Call out the gold. It is easy to find fault in your children. Especially on days where you are over-stressed, over-stretched, and over-tired. Make an effort to be intentional about calling out the gold in your kids — those things that God has placed in them that can impact the world around them. What gifts do you see God has placed in them? When you see flaws, speak the opposite over them. It sounds like a silly and simple task, but this even applies to toddlers. When my kids were potty training, if one of them had an accident, the other would call them a “baby” because they didn’t have it all together. One day, when this was happening, I told my oldest that we were not going to use negative words towards each other. I told them when we make mistakes, it doesn’t mean that is who we are – it doesn’t change our identity. I asked her to call her brother a name that would encourage him – and she did. Now when our kids make mistakes (which we all do everyday), my kids will respond by cheering each other on. If my little boy had an accident, my daughter would say, “Come on Tuck, you are a big boy. You can do it. We will try again next time.” Even at a young age, my kids are learning to call out the gold in each other. Live as a family on a mission. Do you know God’s purpose for your family? I know in our culture, we have been gorged with the idea of finding our individual purposes. But we can’t forget we have been made for each other! Spend time asking God about His dreams for your family. And then be intentional about living those adventures together as a family. Your greatest way to make sure that your kids cultivate a deep history with God is to cultivate your family’s history with God with them. Your ticket for the: Does Jesus Walk Around Your Home?